At Yemen's Sabaeen Hospital, code black is an understatement: patients sleep three to a bed, on the bare floor or outside in tents as cholera brings a country torn by war to its knees. Six weeks into the second outbreak of the deadly disease in less than a year, at least one patient checks in at Sabaeen every 60 seconds, leaving staff unable to cope. "Over the past two weeks, we've been receiving patients at a rate of one or two, sometimes even three, per minute," said Ismail Mansuri, a doctor treating cholera patients at Sabaeen. The situation is nearly indescribable in Yemen, where a long-running conflict escalated in 2015 as regional powers joined the fight for control over the country, the poorest in the Arab world. Two years later, less than half of Yemen's medical facilities are functional as the war has killed 8,000 people, displaced millions and seen port blockades push the country to the brink of famine. Cholera re-appeared on April 27 after an initial outbreak in October 2016, and the United Nations says it is now spreading at an "unprecedented rate". British charity Oxfam estimates the waterborne disease now kills at least one person per hour in Yemen. Hospitals have been overwhelmed, with cholera cases putting emergency rooms in constant code black -- when a hospital is unable to cope with the number of patients. Official figures show more than 920 people have died and 124,000 have been taken ill with cholera since late April, with the rebel-held capital Sanaa hit the hardest. Few areas remain untouched, with the disease affecting 20 of the country's 22 provinces. Experts project at least a quarter of a million people will contract cholera in the next six months. "The hike in contraction is beyond troubling," said Maher al-Hada of Yemen's Center to Fight Cholera. "We have a good 300 patients come through our doors every day". Like other medics, Hada struggles to secure access to electricity, clean water and basic medical supplies as Yemen's Saudi-backed government remains locked in a war with Huthi rebels allied with Iran. Damage to sewage systems, the electricity grid and piping have left Yemen's main water supplies contaminated with the bacteria, and the crisis is only expected to escalate as the rain season approaches. In the southern province of Aden, where the Yemeni government is based, foul-smelling stagnant water has turned black, attracting mosquitos and insects that experts warn are a potent means of transmitting contagious diseases. Majid al-Daari, head of the cholera treatment centre at the Al-Sadaqa Hospital in Aden, said his facility has seen more than 200 cases this week alone. 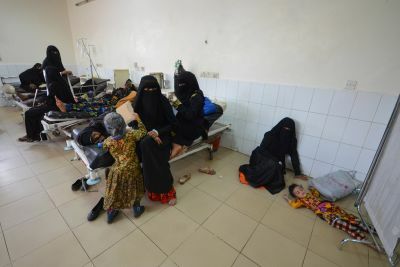 Umm Hisham Munir, the superintendant at a school in Aden, rushed her two sons to hospital when they began to show symptoms of cholera, a bacterial infection which can be deadly if not treated immediately. "We're terrified that the disease will just keep spreading. They can't afford medical care. They can't afford to move," Munir said in Aden. Ammar Abdelmalek, a resident in the rebel-held central Ibb province, said the streets were "flooded" with garbage and sewage. "This is why we have cholera," said Abdelmalek. In the northern province of Lahj, Mazen al-Sayed said the privilege of having a car saved his mother's life. "Honestly it's because I have a car that my mother is still alive. Others die on the spot," said Sayed. The message from aid agencies is unequivocal: more aid is needed to stem the disease from turning into an all-out epidemic. The World Health Organization and International Committee of the Red Cross are two of the groups leading the fight against cholera, but even they face an uphill battle. "WHO is working to access remoted areas heavily affected to reach as many patients as possible," said Omar Saleh, a member of the WHO mission to Yemen. "The humanitarian situation is alarming," Saleh said. "We are looking at a real disaster. The disease has nothing to do with political affiliations".